Pete Buttigieg at the Currier Museum on Friday night. Pete Buttigieg discusses his values at the Currier Museum of Art in Manchester on April 5, 2019. Pete Buttigeg at the Currier Museum of Art on April 5, 2019. Pete Buttigieg speaks to those who could not get inside the Currier Museum on Friday night. Pete Buttigieg speaks with reporters in Manchester. Inside the museum, he emphasized his past military service and the story of his marriage to his husband in front of another couple hundred voters. And he said his “bumper sticker values” are freedom, security and democracy. He described freedom in the sense of “freedom to” and not just “freedom from”; security in terms of climate change, cyber threats and violent white nationalism; and democracy through expanded voting rights, less gerrymandering and, as Buttigieg and other candidates have proposed, prioritizing the popular vote over the electoral college. “And I believe that message is resonating from coast to coast, because every time we arrange a little meet and greet, we wind up with a rally,” he said. As the 37-year-old mayor of a post-industrial Midwestern college town of just over 100,000, Buttigieg is youngest candidate in the race for the Democratic presidential nomination, and he holds a lower elected office than most of his competition. But voters like Jim Winters of South Berwick, Maine, said being a mayor has taught Buttigieg how to be accountable and hands-on. “Not only does he have great innovative ideas, but he appeals to that middle group of people that aren’t so extreme one way or another, so I think he’d represent the country really well,” Winters says. Pete Buttigieg at the Currier Museum of Art on Friday night. Buttigieg has stressed that he wants to explain his values to voters before rolling out specific policy ideas. Some voters said they’re looking forward to hearing those details. But others are willing to wait. Brandon Smith of Newmarket is 23 and says Buttigieg understands his generation’s struggles. He says he likes Buttigieg’s message of unity more than that of his competition. “I’ve seen most of them speak at this point, and I think his message is a little bit more forthright and clear of exactly what he wants as a president, as opposed to the others, who are kind of just jumping around between different issues sometimes,” Smith says. Buttigieg is expected to make his bid for president official on April 14 in South Bend, before returning to New Hampshire the following weekend. 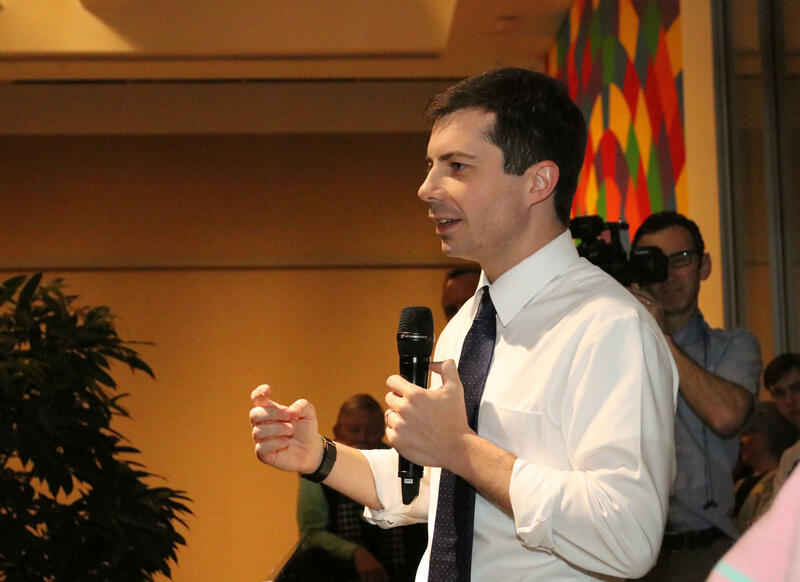 Peter Buttigieg, the mayor of South Bend, Indiana, made another stop in New Hampshire Friday as he contemplates a 2020 presidential campaign. He told the crowd at St. Anselm College’s Politics and Eggs that issues like climate change are personal for him as a millennial. At 37, he's possibly the youngest candidate in a crowded field of Democrats.